Eve Lestrange is here with us, today. Eve, can you tell us a bit about yourself and how many books you have written? Eve: My name is Eve Lestrange. I have written a 3 part (so far) series entitled The Christina Lafage Chronicles, the story of an 18th Century French girl who sells her soul for the power of the Black Arts. Me: Cool! What's the name of your latest book and what inspired it? 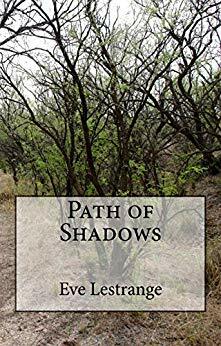 Eve: My latest book is entitled Path of Shadows, the 3rd in The Christina Lafage Chronicles. Me: Sounds spooky. ;-) What are you working on now? Eve: Right now, I am working on a stand-alone ghost story. Me: Fun! What authors, or books, have influenced you? Eve: My main influence as an author is HP Lovecraft, not only for what he wrote, but the style in which he wrote. Me: He was a great author. :-) What are you reading now? Eve: The Occult Book, A Chronological Journey from Alchemy to Wicca by John Michael Greer. Me: I'm starting to sense a theme here. ;-) For those who might consider reading your book, what would you tell them to expect? Eve: Lots of occult imagery, spellcasting, dark deeds & a little romance. Me: Definitely sound like a fun read! What is your favorite part of being an author? Eve: Getting my stories out there. Me: I agree, that's a great feeling. Do you have a day job as well? Me: That's the way it is for most of us, unfortunately. :-/ What are the hardest and easiest parts about being a writer? Eve: The hardest part is trying to block out distractions & the easiest is the writing itself. Me: Yeah, life often gets in the way when you're trying to make time for your art. What genre do you place your book in? Me: Great! Is there anything else you'd like to tell your readers? Eve: If you love witch stories, The Christina Lafage Chronicles is definitely for you. Me: Lots of fans of witches out there. And so these fine folks can find your awesome series, are there any links you'd like me to post?